Available for HÜMÜH Initiates ONLY! Enhance the sacred space of your home and meditation area by playing the powerful sound of this mantra as it is led by Wisdom Master Maticintin and chanted by HÜMÜH Monks. The 66 stanzas of this Sanskrit mantra are a ‘terma,’ or treasure, revealed through the Wisdom Master. The vibration of its chanting provides a meter and cadence that can uplift and enlighten the mind of all sentient beings. Its language contains antidotes for all kinds of suffering, and its repetition cultivates the transmutation of desire into the bliss of the Self-Realized state. 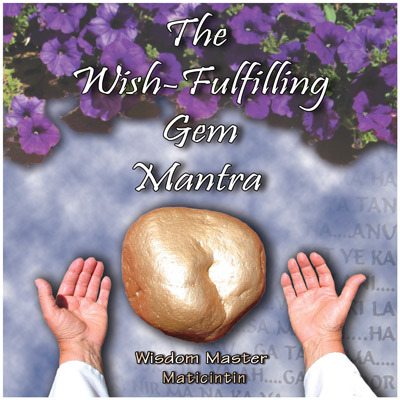 “The Wish-Fulfilling Gem Mantra, to my knowledge, has never before been written down. This is not to say that the individual words have not been written down, but rather the Mantra itself, or the form of the Mantra, has never before been written down. The words themselves are a combination of Sanskrit, Pali, and Tibetan, and each word interlocks a Teaching so profound that, to properly study each word, a person would have to dedicate a lifetime to its study. Each word then is a composite of vast ancient spiritual knowledge that contains all the answers to life and death, through the attainment of enlightenment, including one’s previous incarnations and future ones.